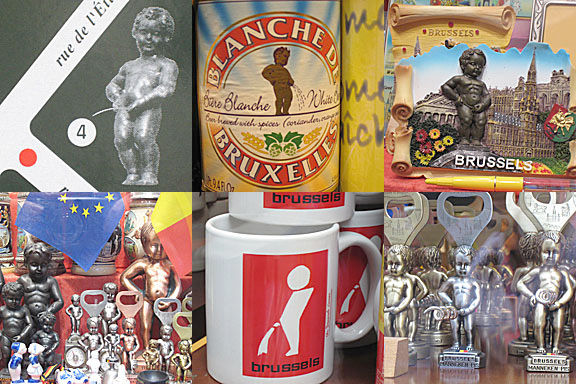 Belgium makes you think of waffles. Right? 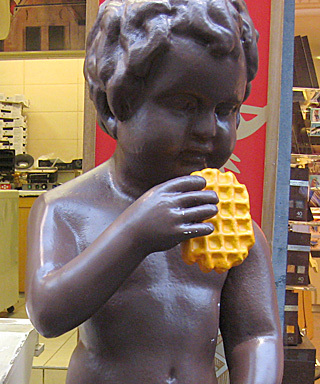 Perhaps you might think the symbol of Brussels, Belgium’s capital and largest city, would be a waffle. I did. I mean, no city would represent itself with a brussel sprout, so what else could it be? Granted, other cities use impressive structures for their symbols. Paris has the Eiffel Tower, St. Louis has the Arch, Seattle has the Space Needle. Maybe the bigwigs in Brussels hoped the Atomium would be the symbol of their fine city. But, alas, the local people had different ideas. 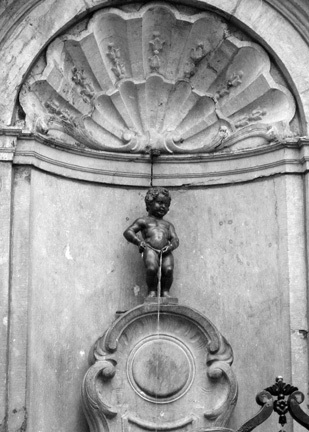 They chose a little bronze statue that’s part of a water fountain in downtown Brussels. The statue is only 24 inches high (much smaller than the replica above). And its name? Here is the rest of the first photo from above. Doesn’t it make you hungry for a waffle?